The Justice Department has asked nearly 50 Obama appointed attorneys to resign. All resigned peacefully except one. 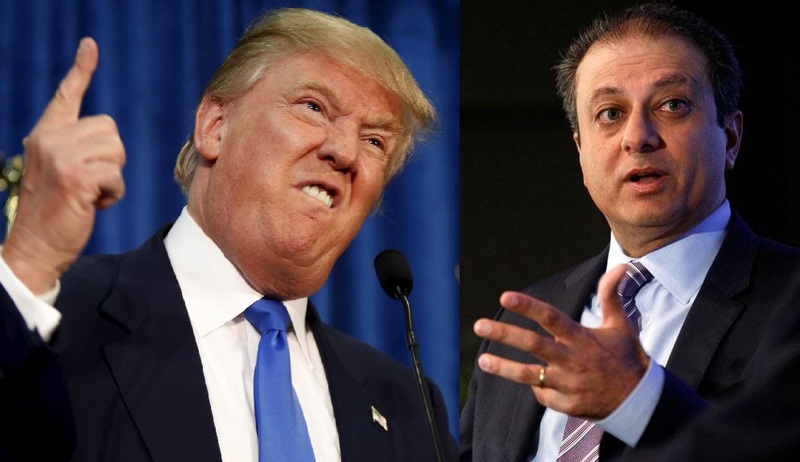 Preet Bharara remained defiant and would not resign, forcing the Trump administration to use force and pull the trigger on him themselves. Trump did what he used to do best and FIRED him. The position of U.S. attorney is a job that can be replaced when there’s a change of President. This means that Trump can replace any and every one of Obama attorney’s at his own will. That’s all part of the changing of Presidents and has been for quite a while. This is the reason that 45 Obama appointed attorneys handed their resignations in without fighting it. It’s all part of the transition of power. Preet didn’t agree with the abrupt and massive swamp drain. Nevertheless, he persisted, but was swiftly defeated. A prominent U.S. prosecutor said the Trump administration fired him on Saturday after he refused to step down, adding a discordant note to what is normally a routine changing of top attorneys when a new president takes office. New York U.S. Attorney Preet Bharara’s defiant exit, first announced on Twitter, raised questions about President Donald Trump’s ability to fill top jobs throughout his government. Trump has yet to put forward any candidates to serve as the nation’s 93 district attorneys even as his Justice Department asked the 46 who have not yet quit to hand in their resignations on Friday. Key positions at agencies like the State Department and the Defense Department also remain unfilled. As the federal prosecutor for Manhattan and surrounding areas since 2009, Bharara secured insider-trading settlements from Wall Street firms and won criminal convictions in high-profile corruption and terrorism cases. He told reporters in November that Trump had asked him to stay in his post, and he refused to resign when asked to do so by the Justice Department on Friday. He said he was fired on Saturday afternoon. “Serving my country as U.S. Attorney here for the past seven years will forever be the greatest honor of my professional life, no matter what else I do or how long I live,” Bharara said in a press statement. Although some question if this was a bad move. Preet’s history speaks for itself. Trump’s massive swipe of all Obama appointed attorneys may have come at a moment of paranoia with the wiretapping incident. Bharara has a fairly impressive resume in regards to legal victories, so maybe Trump’s jumping the gun on this. Maybe he should have extremely vetted his U.S. attorneys before releasing them. The Trump administration needs to replace 46 attorneys and get them up to speed with everything that was currently in motion and now disrupted. Wiping out 46 attorneys at once may prove to be a bad move. A gradual release could’ve provided a smoother transition. Then again, if there IS wiretapping on Trump properties, then what else could be going on? Leaves one to wonder, right?